View of the Borrodale Railway Viaduct, near Arisaig. Oblique aerial view centred on the railway viaduct, taken from the SSW. 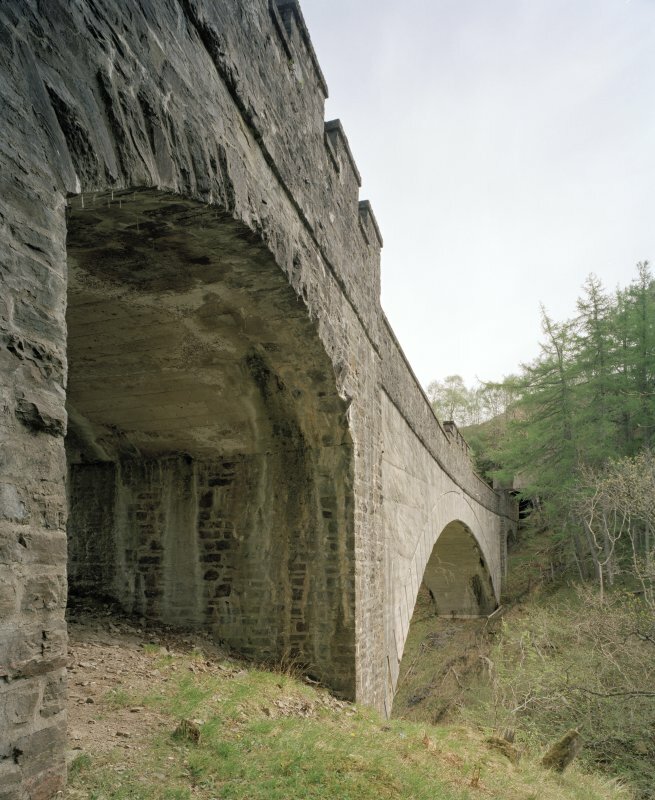 In 1897-1901, making pioneering use of mass concrete, engineers Simpson & Wilson produced for the North British Railway's 40 mile West Highland Line extension a series of bridges, culverts, platforms, retaining walls, 11 tunnels and six viaducts, which have defied corrosion. This monument to concrete engineering earned for its contractor Robert McAlpine the nickname 'Concrete Bob'. 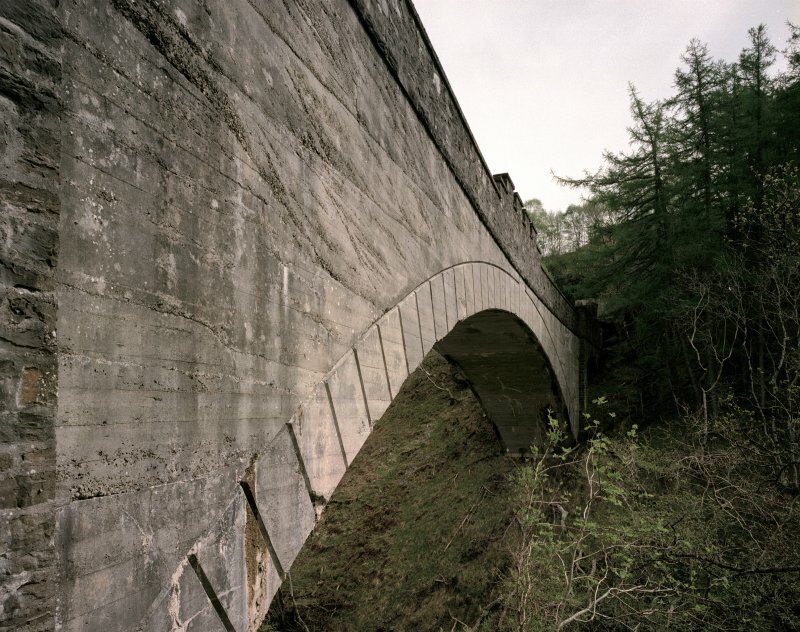 Viaducts: six-arched at Arnabol, eight-arched at Loch Nam Uamh (four each side of a great central concrete pylon); three-arched (with rusticated voussoirs) crossing the Brunery Burn at Larachmor and, most daring of all, a central span leaping 12 7.5 ft over a steep gully at Borrodale, twice the span of any existing arch at the time. For adjacent (to SE) Borrodale Tunnel, see NM69NE 9. (Location cited as NM 698 855). 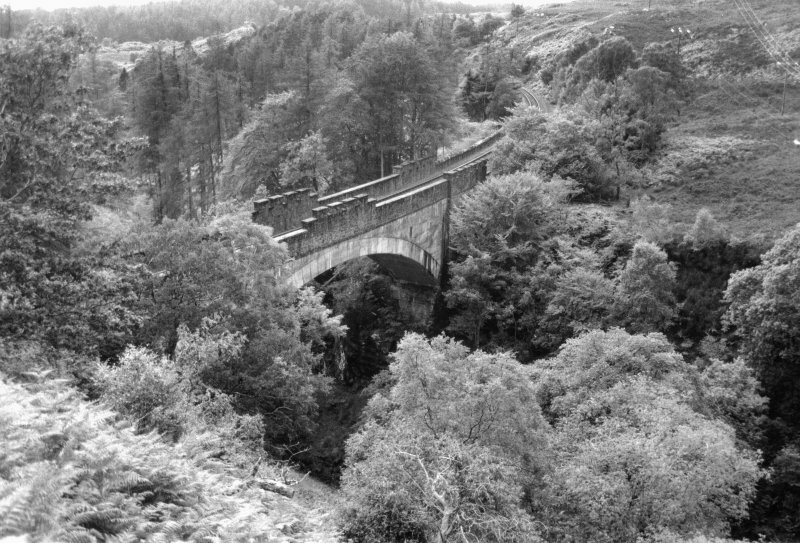 Borrodale Burn Viaduct, opened 1901 by the West Highland Extension Rly. A 3-span mass concrete viaduct, with central 127 ft 6 ins (38.8m) span flanked by single 20 ft (6.1m) spans. In its day was the longest mass-concrete span in the world. 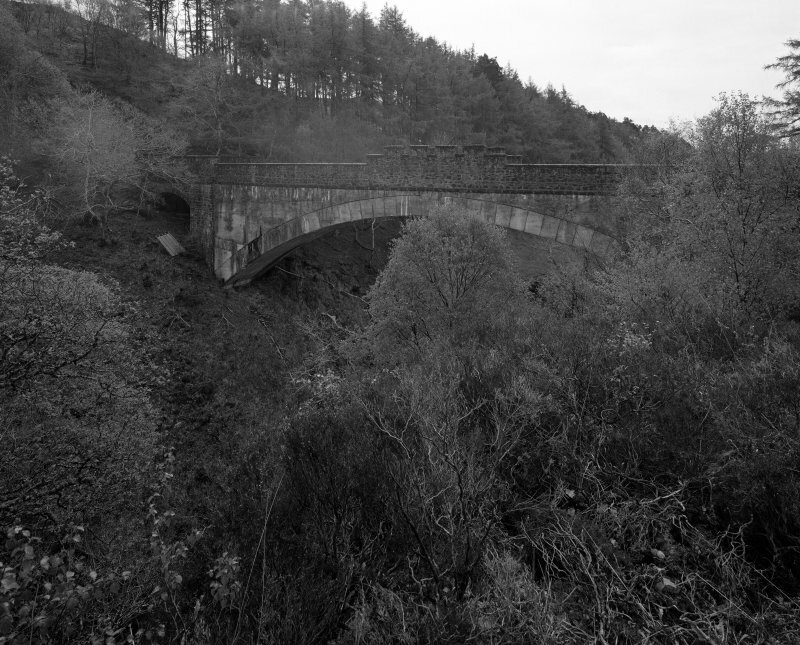 This viaduct was built to carry the West Highland (Extension) Railway across the valley of the Borrodale Burn. The line was opened to traffic on 1 April 1901, absorbed into the North British Rly on 31 December 1908, and remains in use. The design of the bridge was governed by the requirements of the owner of Arisaig House (NM68NE 3). It comprises a single concrete arch of 127 ft 6 ins (38.9m) span and a pair of stone-dressed side spans of 20 ft (6.1m) each. At its completion, it was the longest concrete span in the world. 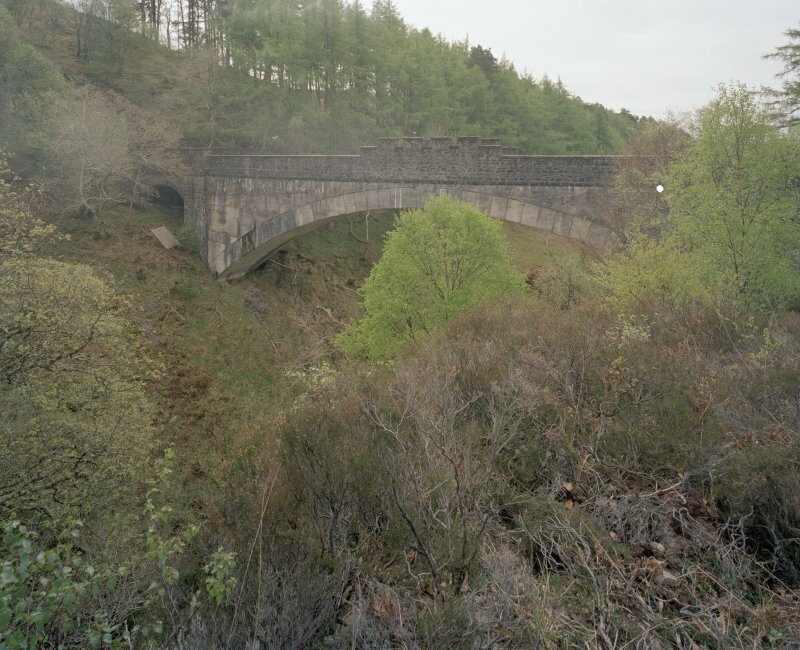 A RCAHMS photographic survey, of Borrodale Railway Viaduct, was undertaken in order to enhance and augment the National Monuments Record Scotland holdings. Visited by RCAHMS(MKO), July 1997. 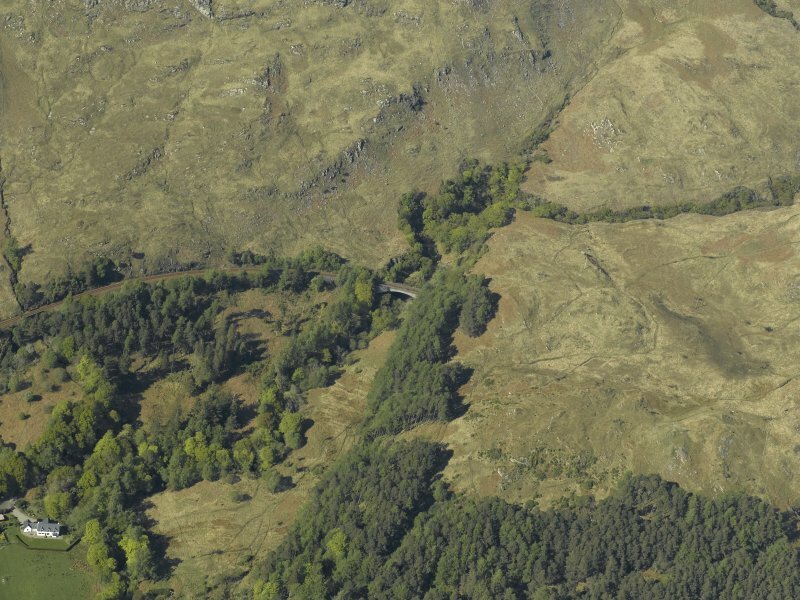 This viaduct carries the Fort William - Mallaig ('West Highland Extension') railway over the Borrodale Burn 550m NE of Borrodale House (NM68NE 3). The location assigned to this record defines the apparent midpoint of the curving structure. The available map evidence suggests that it extends feom NM c. 69780 85482 to NM c. 69644 85502. Information from RCAHMS (RJCM), 10 May 2006.
snaking north-west 140 miles from Craigendoran on the Clyde to the fishing port of Mallaig. 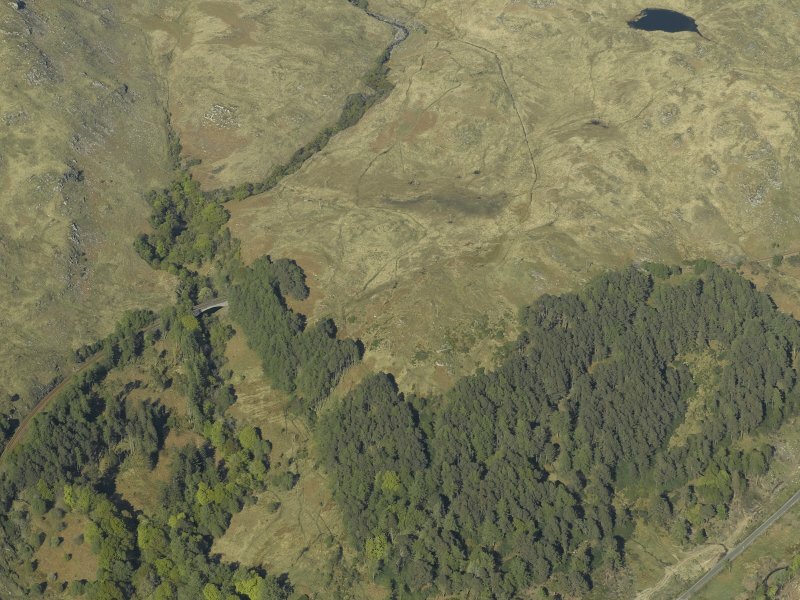 The 100-mile Craigendoran to Fort William section was begun in 1889 and opened in 1894, and the 40-mile Mallaig extension, was begun in 1897 and completed in 1901.
methods of crossing the waterlogged moor on brushwood were developed from traditional experience. Spectacular viaducts include Glen Falloch (NN 3170 2020) 145 ft high, and two in the great Horseshoe Curve above Tyndrum (NN 3350 3620). Financially the line fared precariously during construction and had to be rescued on one occasion by a director, J. H. Renton, using his private fortune. In gratitude his head was sculpted on a massive rock at Rannoch Station by navvies using only the tools of their trade. It is still there. the local rock ( mica schist) was too hard and difficult to dress. Concrete offered a cheap alternative solution. In consequence of his usage of this material Robert McAlpine became known as ‘Concrete Bob’. 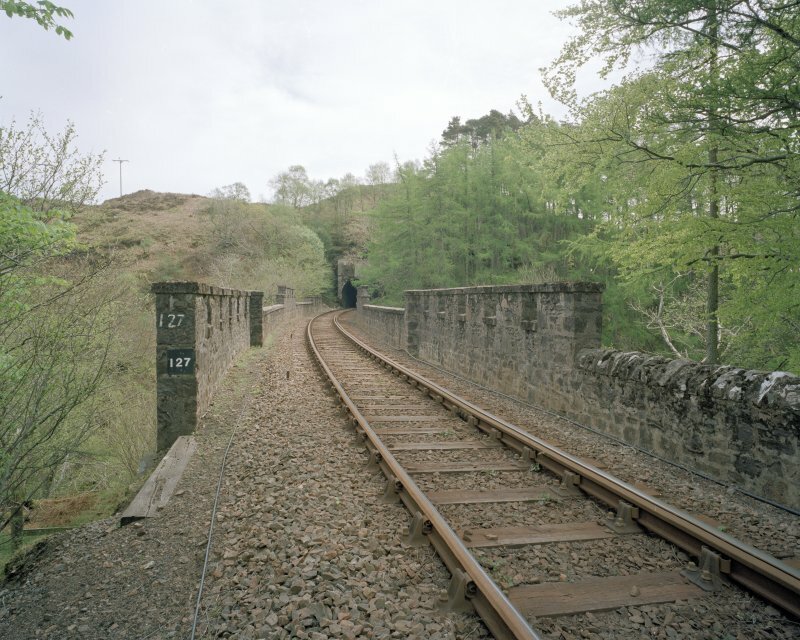 The line’s most notable elements are Glenfinnan and Loch nan Uamh viaducts and Borrodale Arch. The railway was designed by Simpson & Wilson, consulting engineers, and the contractor was Robert McAlpine & Co.
Borrodale Bridge has three arched spans, the central one of 127 1/2ft was said to be the longest concrete arch in the world when built. Its soaring unreinforced-concrete arch, built on a curve in plan, exudes confidence. The rise of the arch is 23 ft and its height above the burn is 80 ft. Its arch-ring, composed of concrete comprising four parts sand and stone to one part cement, is 4 1/2ft thick. 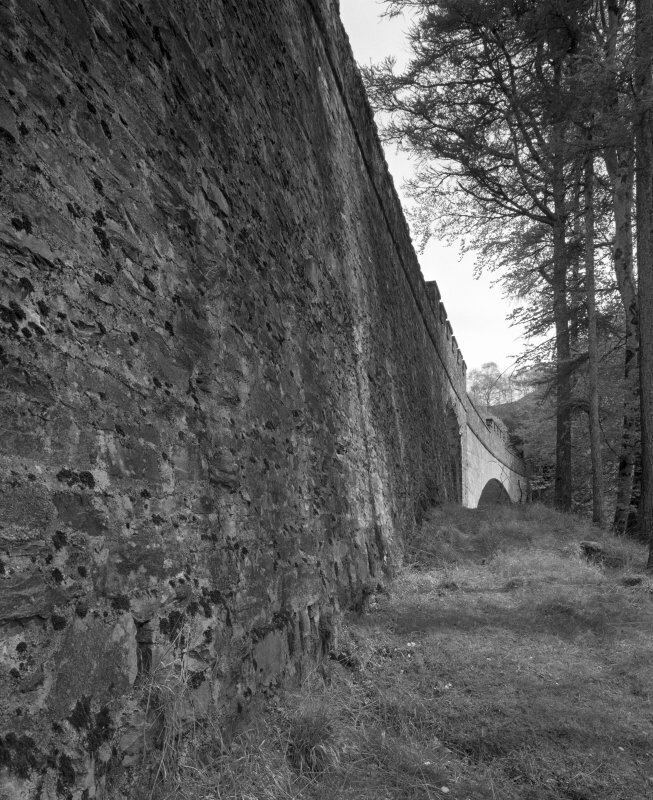 The 20 ft side spans were clad in masonry and the bridge was given castellated masonry parapets to mollify a local landowner.